Born in Minnesota, USA around 1855 to John and Laura Bingham of New Hampshire, Frederick V. Bingham married Mary E. Armington in April 1878. 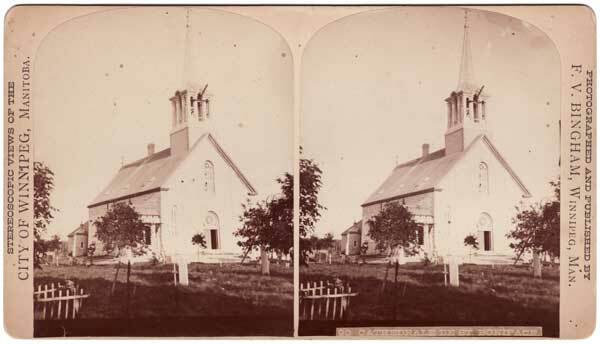 He worked as a photographer in Northfield, Minnesota, either alone or in partnership with Ira E. Sumner, taking stereoview images from the town in the series “Stereographs of Minnesota Scenery”. 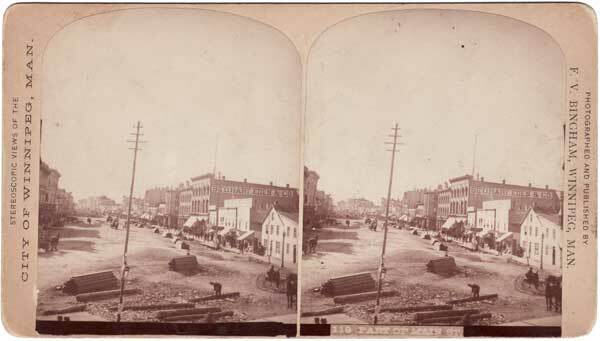 He also took stereoviews in nearby Cannon Falls, Minnesota and in neighboring states, such as the series “Beauties of Clermont” featuring scenes and buildings in Clermont, Iowa. 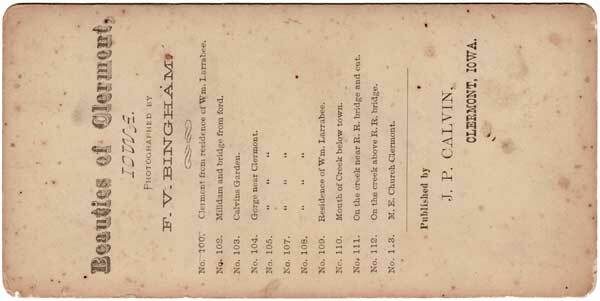 A 1879-1880 city directory of St. Paul, Minnesota shows Bingham as operating a music store there. Bingham’s relationship with the Canadian Pacific Railway remains unclear. Although many of his photographs state that he was an “Official Photographer to the CPR”, there are no records in the company’s archives that they employed Bingham formally, nor was there a formal endorsement of his work implied by his “official” status. However, the railway did purchase copies of his photos on several occasions, often with many duplicates of the same image, for use in promoting its facilities in general, and western travel in particular. In late 1882, Bingham was sent west by W. R. Baker, Assistant General Manager of the CPR at Winnipeg, to take photographs of the line and scenic views but he returned without much success, claiming to have been hindered by “smoke and other obstacles.”  A second attempt later in the year was likewise unsuccessful, according to Baker. However, Bingham was apparently more satisfied with his results, and in May 1883, he asked William Van Horne to provide him with free transportation into the western mountains for himself and two assistants, letters that he could provide to CPR employees along the way to solicit their help where needed, and supplies from railway stations in the mountains. Van Horne granted the request but refused access to supplies that he said belonged to railway contractors. But he agreed to intercede on Bingham’s behalf to obtain supplies from the contractors at cost. 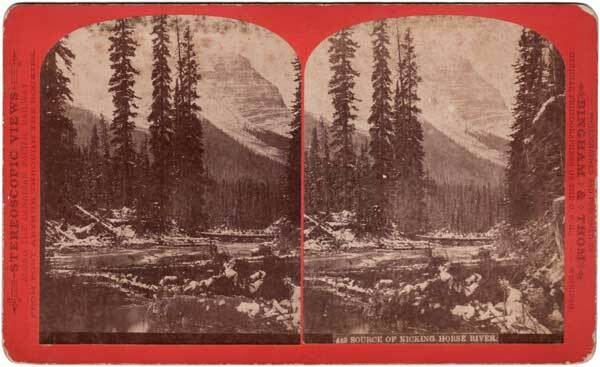 The next day, Bingham left on a west-bound train, expecting to take around 150 photographs along the line between Calgary and the west coast over a three-week period. By this time, he was working with the Vancouver photographic studio of C. S. Bailey . By 1890, however, Bingham was back in the USA, being a landscape photographer in Superior, Wisconsin  then, three years later, at a studio in Omaha, Nebraska . By 1895, the 40-year-old Bingham was in San Francisco, California, where he married 31-year-old Alice M. Garcelon . In 1898, he was the general manager of the West Coast Photo Manufacturing Company, based at 271 South Main Street in Los Angeles, supplying photographic paper to photographers. He spent the remainder of his life in California, living at Pomona City in 1910, and Los Angeles in 1920. He died there on 9 September 1929 at the age of 74 years. 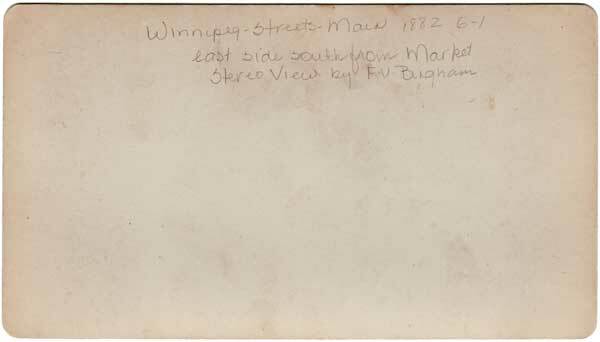 Bingham was itinerant for the majority of his time in Manitoba, apparently having a storefront studio only in 1881. 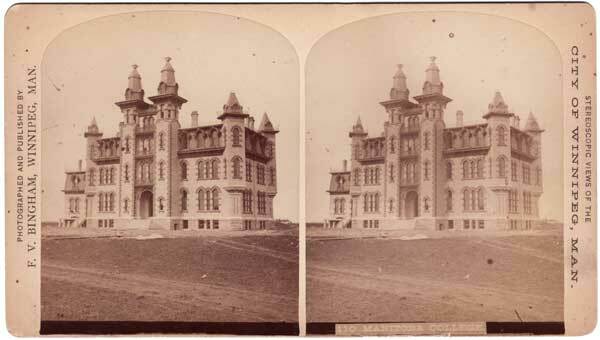 One of his photographs taken circa 1886 gave his address as “Room 3, Catherine Block, corner King and Alexander Streets” - a boarding house in Winnipeg. 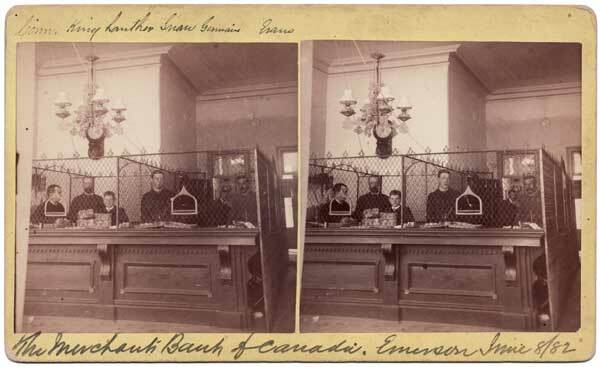 Source: Archives of Manitoba, Emerson - Buildings - Merchants Bank - 2. 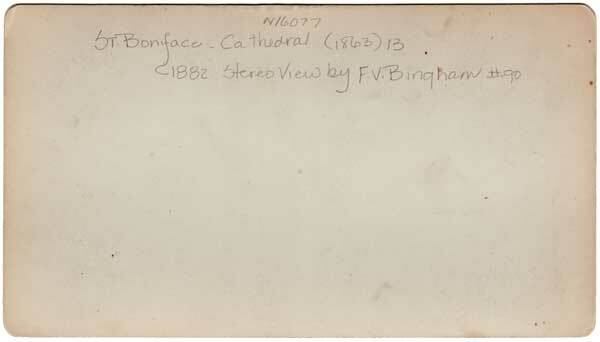 Source: Archives of Manitoba, St. Boniface - Cathedral (1863) - 13. 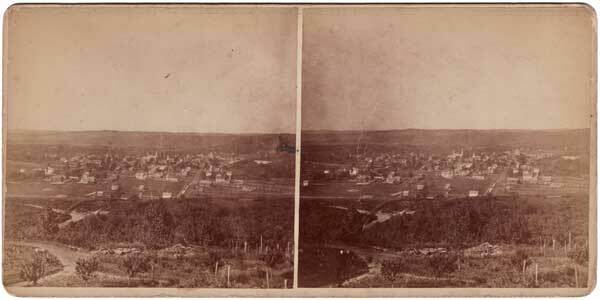 Source: Archives of Manitoba, Winnipeg - Streets - Main 1882 - 6-1. 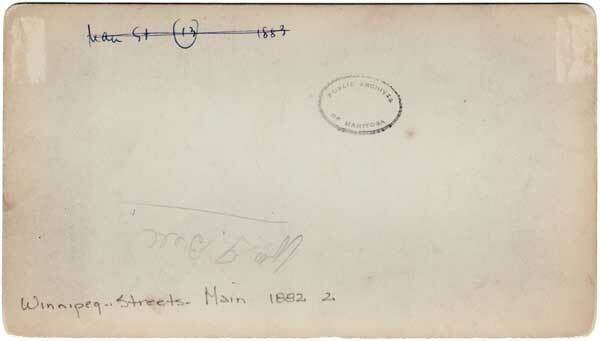 Source: Archives of Manitoba, Winnipeg - Streets - Main 1882 - 4. 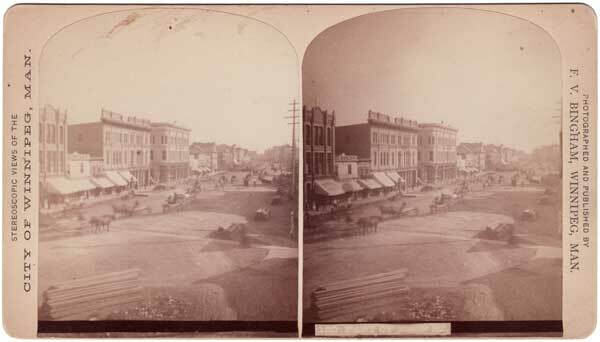 Source: Archives of Manitoba, Winnipeg - Streets - Main 1882 - 3. 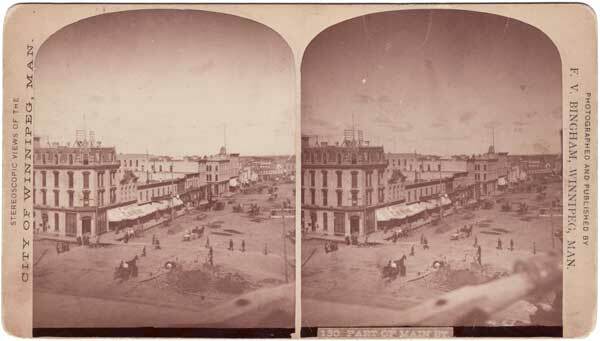 Source: Archives of Manitoba, Winnipeg - Streets - Main 1882 - 2. 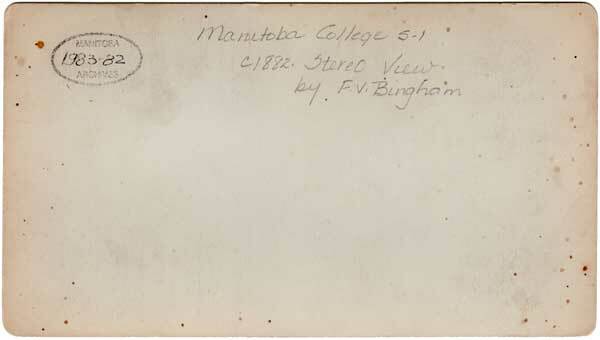 Source: Archives of Manitoba, Manitoba College 5-1. 1. 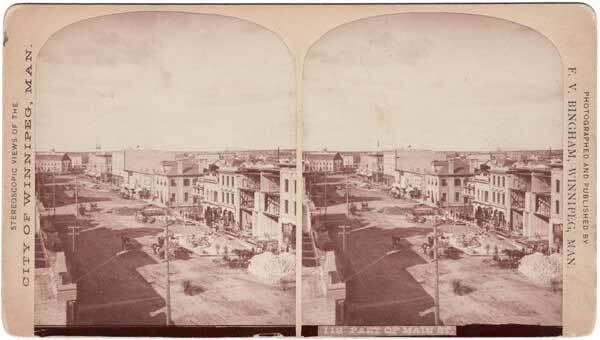 Archives of Manitoba, Bingham stereoview of Merchants Bank, Emerson - Buildings - Merchants Bank - 2. 2. 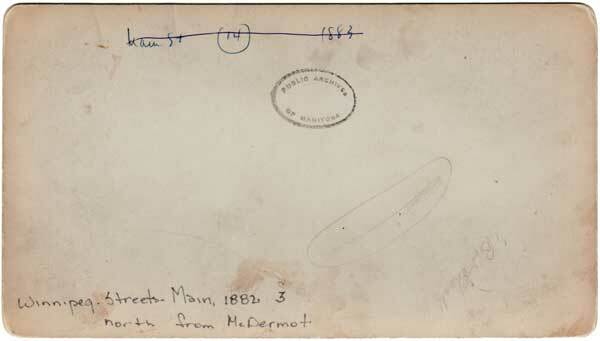 Only a few letters were exchanged between F. V. Bingham and William C. Van Horne and other officials of the Canadian Pacific Railway. 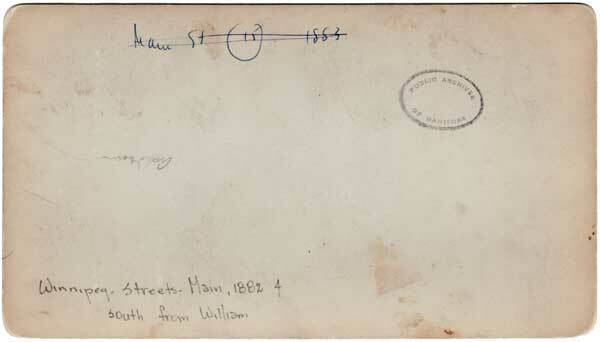 Bingham’s letters mostly dealt with sale of photographs to the railway or requests for free passes on their line. None suggested that any formal relationship existed between Bingham and the railway, contrary to the impression given by the phrase “Official Photographer to the CPR” that appears on many of Bingham’s photographs from this period. I thank Bob Kennell and Jo-Anne Colby of the Canadian Pacific Railway Archives in Montreal for providing access to their files, and their interest in the project. 3. 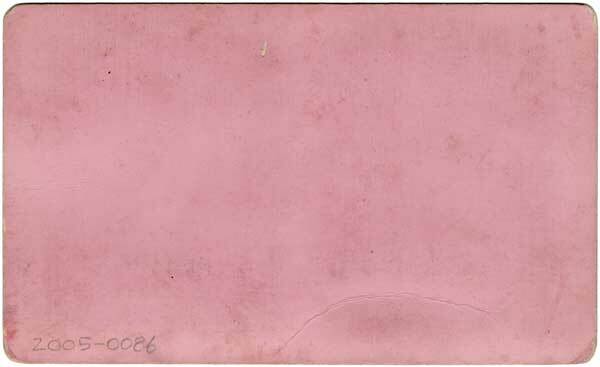 Canadian Pacific Railway Archives, RG1A, File 97, letter dated 13 February 1883 from W. R. Baker to W. C. Van Horne. 4. Canadian Pacific Railway Archives, RG1A, File 97, letter dated 25 May 1883 from F. V. Bingham at Winnipeg to W. C. Van Horne. 5. Manitoba Daily Free Press, 16 April 1884, page 4. 6. Canadian Pacific Railway Archives, RG1A, File 11827, letter dated 9 February 1886 from F. V. Bingham at Port Arthur to W. C. Van Horne. 7. Canadian Pacific Railway Archives, RG1A, File 12833, letter dated 30 April 1886 from W. C. Van Horne to F. V. Bingham at Schreiber, Ontario. 8. Canadian Pacific Railway Archives, RG1A, Van Horne letters, volume 17, letter dated 6 September 1886 from W. C. Van Horne to F. V. Bingham at Rat Portage [now Kenora], Ontario. 9. Calgary Weekly Herald, 30 October 1886. 10. Calgary Weekly Herald, 1 November 1886. 11. 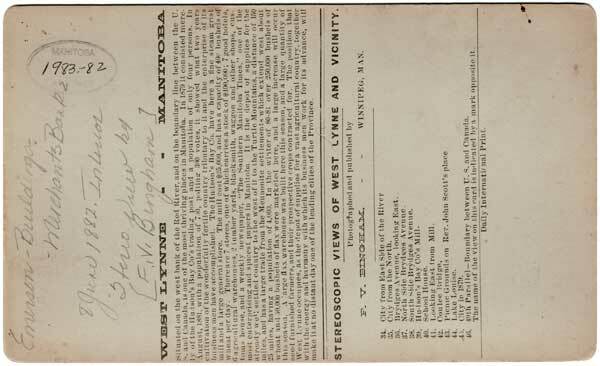 David Mattison, Camera Workers: The British Columbia, Alaska & Yukon Photographic Directory, 1858-1950. http://members.shaw.ca/bchistorian/cw1858-1950.html. 12. Superior, Douglas County, Wisconsin Photographers 1890-1892. http://freepages.genealogy.rootsweb.com/~amerikin/wi/suph1890.html. 13. Carl Mautz, Biographies of Western Photographers: A Reference Guide to Photographers Working in the 19th Century American West, Carl Mautz Publishing. 14. San Francisco Call Vital Records for 1869-1895, http://feefhs.org/fdb2/6995/6995-48.html. We thank Ron Lerner for providing additional information used here.